It’s funny, the more and more people you follow on twitter the more and more challenging it becomes to “pay attention”. You just can’t do it if you don’t use some kind of twitter monitor like Tweetdeck , Hootsuite, Seesmic, or any others of the like, one of my favorites right now is SocialOomph because it makes it easy to engage those looking to engage me. The funny thing is I actively use them all to stay on top of new advances so I can share the best option for each specific client, but I digress, let’s get back to the Twitter Vomit, which I notice taking up complete columns of updates, especially in the am. What is Twitter Vomit? Clipped from “Twitter vomit” and other observations. When you see someone post a bunch of self-serving tweets in a short amount of time, watch your feet, because the vomit is a spewing. The lesson should be obvious, but appears it is not. Rather then load up your twitter shotgun blasting your followers, try “dripping” your post out throughout the day. Sure you have a message you are trying to get out, but most people will begin tuning you out, or running from the stench. 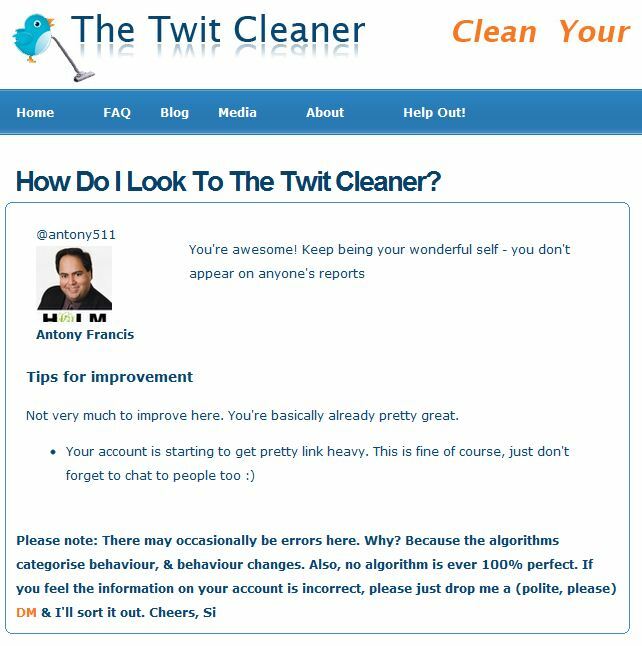 The Key to avoiding being guilty of Twitter Vomit? Remember that social media is an interactive platform, not a radio broadcast, it is a conversation. God gave you one mouth and two ears so that you may listen twice as much as you talk. Only by showing others that you care, and are interested in them, will they show interest in you. As a Realtor from the 90’s I remember cold calling, I hated it, but I did it because I knew it produced business. Today I push those I coach to “Cold Call” using Twitter, ok it’s not really cold calling but it is a form of prospecting. First thing you need to do as a business is identify your target audience. If you are a doctor, you might target other doctors, or even attorneys who refer accident victims to doctors. Consider who your customers are as well as who might refer you to customers, now you have your targets. Step 1 A great first step in prospecting is Twellow. 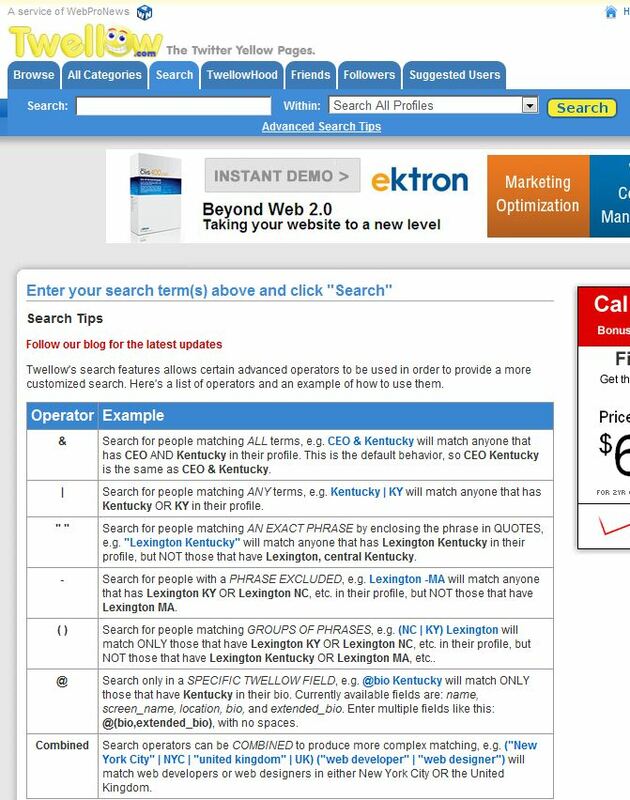 This site lets you search by area and “business” (provided the person filled in a profile) not everyone has done a profile there, but their searching functions seem to work great even for those not registered with them. I usually recommend geographic area around where you would like people, and some descriptive of who you are looking for. i.e. Doctors in the Tampa area. Now read through the results following those who you think match the criteria you came up with for your target market. I would consider listing them under prospects (as a private list). Another great way to prospect is take a look at who one of your contemporaries is following. With both of you sharing simular goals, you should find that they have some of your targets on the list of people they follow. Also consider who else might be looking to follow the same target market as you, in the case of a doctor, you might look to see who the local hospital or medical associations are following, and follow those same people. My recommendation is to try and add 5 a day, 25 a week, this number might vary depending on your target audience, but set a goal for each week, and hit it. Step 2 Basic Twitter psychology seems to dictate that when someone follows you, you stop and look to see who it is, and often you follow them back. By following your target market, you are making your first call for them to follow you back. Not everyone will follow you back, especially if they feel there is no benefit to following you. If they do not follow you back , un-follow them on your next Thin down Thursday, but do add them to a private prospect list. Step 3 Set your Twitter reader to show you a column of prospects; now look for authentic opportunities to engage them. Notice I said engage and not sell, if you sell them they will run. Again think of prospecting; if following them is like a cold call, engaging them is like “farming” it takes more than one post card, you need to hit someone 5-7 times before they really notice you, this could take a few days or a few weeks depending on their volume of tweets. You do not want to come off as that creepy stalker who comments on everything they say, pace yourself. Eventually you will find that if they have noticed you and you have not turned them off, they will eventually follow you, now you can follow them back. Step 4 Now that we have a Follow and Follow back relationship, keep looking to engage like you did in step 3, but also start tweeting information that your target audience will find useful. Share links of articles you find useful, post links to your own blog articles, RT (Re-tweet) useful information that your Tweeps are sharing with their followers (you), as not all your followers follow the same people you do. Keep in mind all these contacts should be public @Tweets and not DM Conversations, as this will show others that you are active and engaging on twitter. All these “light” touches help you keep top of mind awareness with your followers, and as a result, when they have need of your product or service, you should be first person on their list of people to talk to. I bet most of you don’t think about how many ways what you said can be read, well you need to when taking spoken sarcasm and translating it to text. I learned when I was at Realtor.com that my direct communication approach could often be misinterpreted as hostile or sarcastic. Over time I learned to master the tone in my writing, so that if ever there was a question, it was because I was trying to keep someone on their toes, and motivate them with a double meaning message. This is OK on rare occasion, but if you speak “double tone” (to me: meaning the same passage can be read with more than one tone of emotion) all the time, you will be taxing your readers and friends much more than most people can stand. I believe this affects people less practiced at written communication; almost any social media with updates. Think about it, until the last few years with all the social media coming out of the wood work, how much written communication was used by the average person. Sure there was e-mail, but you are given much more room to try to convey the emotion behind the writing in an e-mail, however when you are limiting yourself to 140 characters, how can someone know when you are being sarcastic? I was again thinking of those newer to twitter, and those who might not have learned how to better manage their twitter accounts and wanted to share some tips that so many take for granted. Know your numbers, and how they affect you. Looking at an accounts profile page you will see; Following, Followers, Listed & Tweets. These four numbers can give you a lot of insight about an account, keep in mind what they might say about you. If the account is following a larger percentage then those following it, the account is either newer or the person just keeps adding people without making any connection to those people they added. While this ratio is not a kiss of death, it does make people wonder why so few are following you. 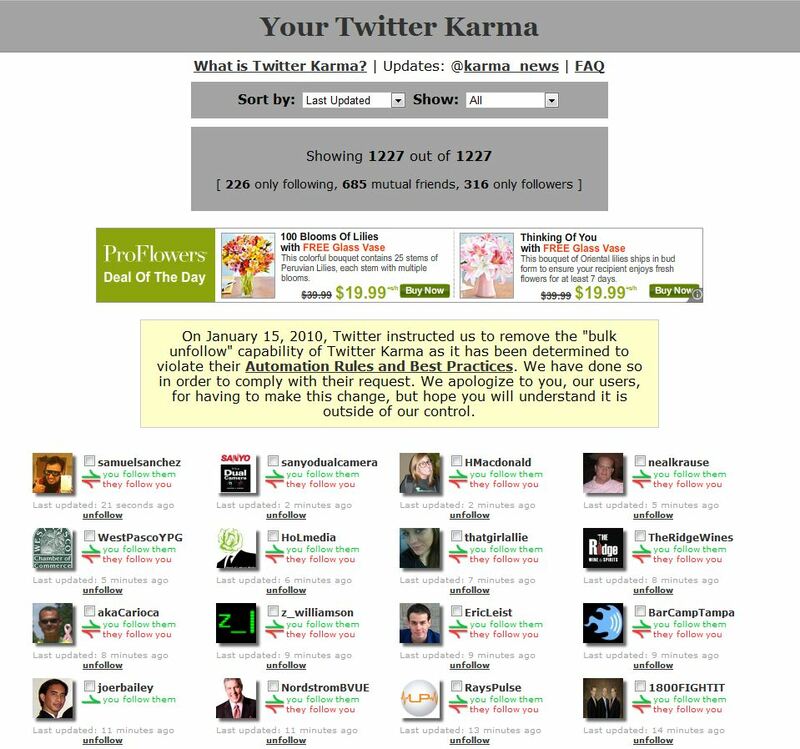 You can use a tool like Twitter Karma which shows you who you follow that is not following you back and visa-versa. My recommendation is that you take the people who don’t follow you and place them on a list, this will allow you to continue to follow them without actually following them. One such list I set up for myself is Study of Social Media , this list allows me to follow people I feel I might benefit from listening to, who chose not to follow me back as well as those I follow who follow me back. Usually these people who do not follow you back will show a large number for Followers but a small number for those they follow. I translate this as someone who has a lot of self-worth, but sees little value in connecting with others (entertainers usually fall in this category), list them if you wish to listen to them, but I see no reason to follow someone who is not willing to meet you half way. This is where “Listed” can come in handy, click on it and see what kind of lists others have put this person on. If they appear on some good lists, list them, if not, move on. Ultimately a good balance should be struck between those you follow and those following you. Lastly look at the number of tweets on the account, if someone is following a bunch of people and have very few following them with a large volume of tweets, chances are they are just tweeting promotional stuff. as well as how you look to others. With any tool, you need to know that the possibility of errors exists, I have not caught one yet, but they do help you in trim the fat from your account and warrant a try. My recommendation is pick one day a week, for me it is ThinDownThursday #TdT. I dedicate time to go through and fine tune my following list. I don’t think it is bad if you follow a lot of people and have a lot follow you, as long as you are looking to see what you can share with others and what they can share with you. I follow people by assigning them into a list that makes sense to me, and I use an app like Tweetdeck, Seesmic or Hootsuite to monitor my lists. Here is how my Tweetdeck looks, notice how I have a list to make it easy for me to look at different conversations that I wish to follow. Last week when working with a new client that I am coaching in social media integration, we focused on Twitter, and I was reminded of my first home buying experience. I was in real estate for a few years, but always worked on the seller side, and never went to a closing (in NY the attorneys handle the closing details). Everyone involved seemed to forget it was my first time buying a house, and going through the buyer side to closing, as a result assumptions were made and I was frustrated and made uncomfortable. I realized the need for a buyer training program that assumed they knew nothing and that held their hand through the process and created one that was very popular…flash forward. This week I read three good twitter articles (see below) that made me want to share my experiance. Many of us who use Twitter regularly have a hard time remembering what it was like to not have an idea. People new to twitter don’t know what we know, and we need to assume they know even less then we did, or they would have jumped in sooner. With that in mind I wanted to share a few things we discussed after setting up the initial account. First, Do fill in your profile, as more experienced tweeters will not follow you if they can’t tell what you are about. Now mind you newbies who might be reading this, this is not an all inclusive, but instead, the tip of the iceberg of things to consider. You need to figure out who you want to follow, and you should keep in mind why you want to follow them, and why they might want to follow you back. Check and see who you might already know on Twitter; Twitter makes this easy as it will search your Gmail, Yahoo, Linkedin and AOL accounts to see who you might already know using twitter. Search on Twitter Search for keywords that will guide you to people tweeting on topics that you like. I also like to use Twellow as it gives you the ability to search for businesses and individuals that you might wish to develop a relationship with by categories or area. Last week we were searching for doctors in Florida, and guess what, we found them. Keep in mind most people will look at you following them and wonder why, answer that in your initial tweets and in your profile. i.e. I focus on new technologies and social media, so it should not be rocket science to individuals who study social media why I am following them. The bonus is that hopefully they will follow you back. Do create lists within Twitter to help you better manage the people you follow. I recommend: Friends, People I’ve met, prospects (might want to make this or other lists private) and what ever other groups you might need. You can add people to a list without following them, you might choose to demote those with thousands of followers who don’t follow you back to a list, I have a Media list of people I don’t expect to follow me back. BTW you can follow other people’s public lists, so look and see what lists your friends have. When you start out, if people see you following a bunch of people and only a few following you back, not to mention very few tweets, they are going to look at you a little skeptical as this could easily look like a spam account, so try to be active showing your real, and discuss being new and wanting to learn from others in the medium the proper etiquette as well as what to do and not do. When someone follows you, follow them back, you could dm (direct message) if you wish, but it is not a big deal if you don’t. Just make sure if you do, it looks authentic from you to them, and DO NOT PLUG your business. If people think you are only their to sell them, they will un-follow you fast. My favorite is when real estate agents ask if the can help me with my housing needs on their first DM, Unfollow. Make sure you look at these articles; The Lemonade Stand Approach…Twitter for Home Based Business, 50 Ideas on Using Twitter for Business, and Treat Your Social Media Contacts Like You Would A Third Date.